Pineapple Log Cabin Quilt – in its forever home! Our fans and friends who really know us are well aware that we have this “thing” about quilts as art: We’re easily riled when someone calls a quilt an “arts and crafts” item, or describes a quilt or quilt maker as “crafty.” We are firm believers that quilts truly are art! Our first Pineapple Log Cabin quilt in ages! After a very long spell we recently we received one Pineapple Log Cabin quilt. Then, very shortly thereafter, a second. There aren’t many makers of this pattern. It’s a lot of very small pieces of fabric, making it unwieldy and enormously time consuming to piece. 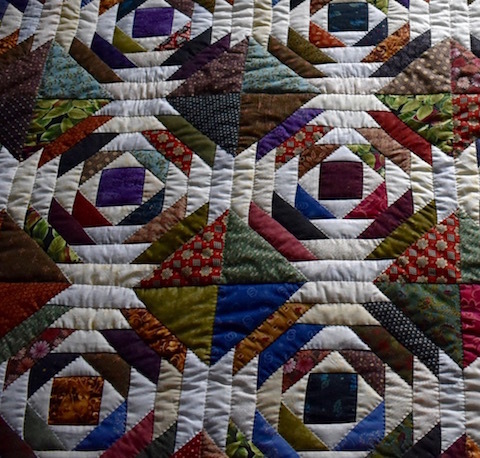 All those little pieces result in a hand-quilting nightmare. It took years to find a maker willing to take on the task and now we get a Pineapple Log Cabin quilt in once every 18 or so months. As you can imagine, we were happy to have two! Pineapple Log Cabin in its gorgeous forever home! We sold one of our Pineapples immediately – to one of the nicest and kindest people we’ve met since starting this business. We’re always happy when one of our quilts goes to a good home and this Pineapple went to one of the best. 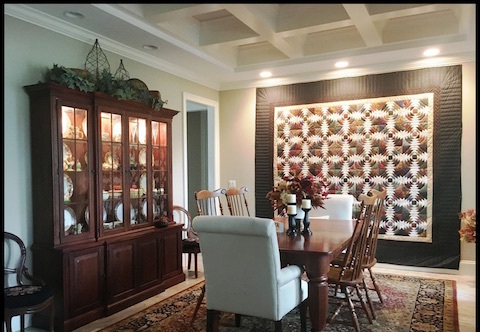 The buyer loves her quilt and put it to good use immediately. She took this picture and sent it to us. 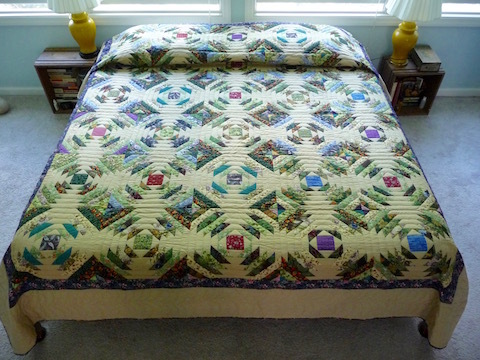 We wanted to share this with you because think you’ll agree that this is one really good-looking quilt!